I love me a good cafe. And in Santa Monica, California, you'll find plenty of nice ones. Airy, sunny, often with outdoor seating. You can smell the ocean in the air if the wind is right. My new favorite is a bit in-land, but what they lack in the scent of sea air, they make up for in the smell of sweet carbohydrates. It's called Huckleberry Cafe. 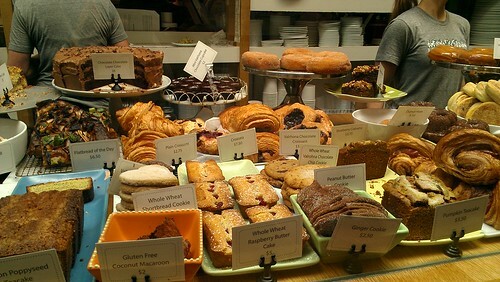 It's owned by a couple--half of which earned their baking chops at San Francisco's famed Tartine Bakery. I had read about Huckleberry on websites and in magazines over the past few years, so I was delighted to finally have a chance to visit while spending a few days in Santa Monica. 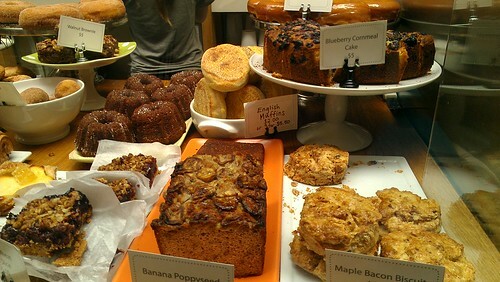 The website told me that "Everything served at Huckleberry is made on site using the best quality ingredients, including organic flour, Vahlrona chocolate and farmer’s market produce. The menu changes regularly with the seasons and on the baker’s whims." So, I'll tell you what I had, but I can't guarantee it will be there when you go. First, the maple bacon biscuit. I am a biscuit lover, and this one was a fine specimen. 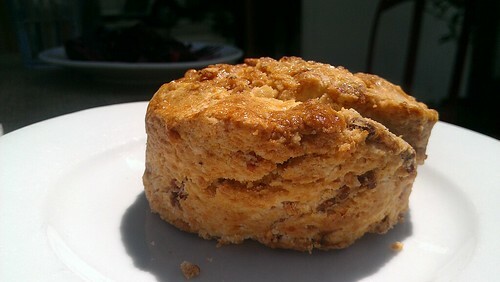 Sort of like a hybrid between biscuit and scone, texture-wise, with a mellow sweetness from the maple. Yum. But then it was punctuated by salty spots of bacon. This was no "bacon just for attention" type of sweet. It was really effing good. 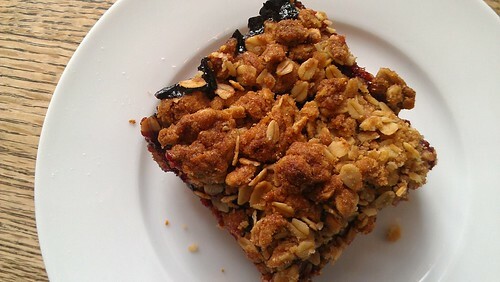 Next up was the multigrain oat bar with a cherry filling. This was different, I was told, because it usually has blueberries. Whatever. This cherry thing was freaking good. 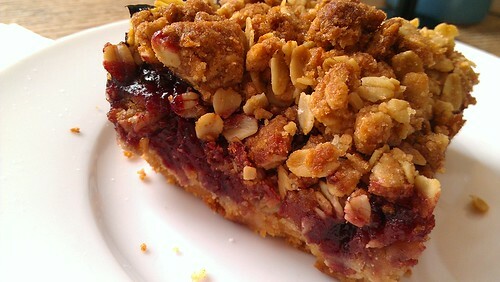 Tart cherries against a backdrop of oaty buttery cookielike goodness, then topped with brown sugary crumble. Don't be fooled by the word "grain" and the presence of fruit--this is not health food. No way, man. It's tasty-town. The bakery case is STOCKED, though. 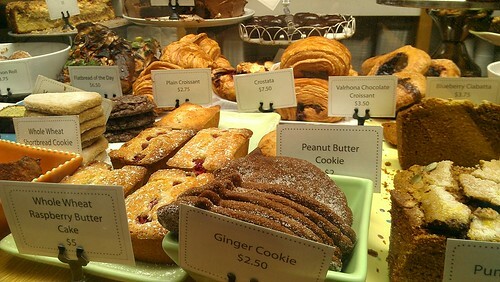 You'll find shortbread cookies, croissants, cakes (cornmeal blueberry? YES! ), layer cakes, scones, biscuits, and then in the cold case, trifles and salted caramel bars and other tasty stuff. Huckleberry is mos' def a new favorite of mine. It's a fantastic place to spend time and eat. I hope you'll visit next time you find yourself in sunny Santa Monica! Also go visit my sister. You might find her around the new Doc Martens store! She does all of the retail planning for them, so feel free to be effusive about their fantastic displays. Huckleberry Cafe, 1014 Wilshire Boulevard, Santa Monica; online here.